Camila Giorgi cruised past Australian wild card Alja Tomljanovic 6-3 6-3 in her opening match at the Sydney International setting up a second round-clash against defending champion and 2018 Wimbledon winner Angelique Kerber. The Italian player, who started the year ranked world number 26 after winning her second title in Linz last October, won 76 % of her first serve points and hit 21 winners to 20 unforced errors. After a rain delay at 2-1 in the first set Giorgi got a break in the sixth game to take a 4-2 lead at the end of a long rally. The 2018 Wimbledon quarter finalist rallied from 0-30 down to hold her serve for 5-2. Tomljanovic fended off two set points in teh next game to hold her serve for 3-5. Giorgi did not convert three more set points, but she she earned a sixth chance with an ace. She converted her chance after Tomljanovic netted a forehand. Giorgi saved a break point in the first game of the second set before breaking serve in the third game to take a 2-1. Tomljanovic broke straight back to draw level to 2-2 and held her serve to take a 3-2 lead. Giorgi broke again in the seventh game to take a 4-3 lead with a forehand winner. Giorgi earned three match points at 5-3 with a forehand return winner and sealed the win two points later. Giorgi will face Angelique Kerber, who beat the Italian best player in the semifinal of this Australian tournament last year. Kerber showed her recent good form at last week’s Hopman Cup in Perth, where she led Germany to the final before losing to Switzerland in the title match. 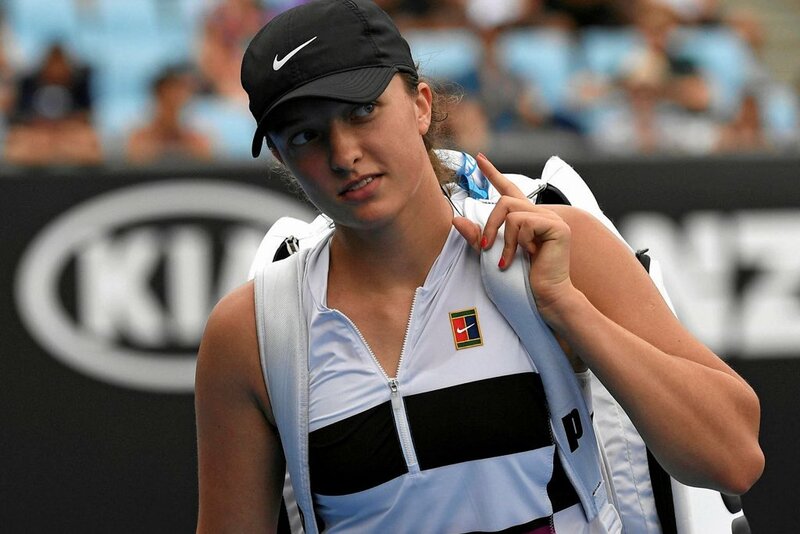 She beat Ashleigh Barty, Garbine Muguruza, Belinda Bencic and Alizé Cornet in Perth. The winner of the Giorgi vs Kerber clash could face either Petra Kvitova or Shenzhen champion Aryna Sabalenka in the quarter final. Sabalenka beat Kvitova in the fourth round at the 2018 US Open. The other interesting first-round matches will be Anett Kontaveit vs Elise Mertens, jelena Ostapenko vs Ashleigh Barty. Garbine Muguruza beat her compatriot Carla Suarez Navarro 6-3 6-4 in their first match since February 2015 to improve her win-loss record against her compatriot to 2-1. Muguruza went up a double break in the third and fifth games to open up a 4-1 lead. Suarez Navarro pulled one break back in the sixth game for 2-4 but Muguruza held her next service games to win the second set 6-4. “It was tough, because Carla and I are good friends, but it’s competition, so we have to put on our poker face and try to win”,said Muguruza. Muguruza set up a second round match against Kiki Bertens, who battled past US lucky loser Bernarda Pera 7-5 6-4 in a hard-fought match. Pera, who received a walkover after Joahnna Konta’s withdrawal, broke serve in in the opening game and earned a chance to close out the first set at 5-4, but Bertens broke back in the 10th game to draw level to 5-5. The Dutchwoman broke serve for the second game at 15 to seal the first set 7-5. Bertens earned two break points in the sixth game of the second set and three more opportunities in the eighth game, but Pera held on her service games. Bertens earned two match points, as Pera was serving at 4-5 15-40, but the US player saved them. Bertens converted her third break point (the eighth chance overall in the 10th game, when Pera made a double fault. Australian player Samantha Stosur came back from one set down to beat 2016 WTA Finals champion Dominika Cibulkova 3-6 6-3 6-4 after 2 hours and 21 minutes in a clash between two Sydney International finalists. The home player will face Timea Bacsinsszky, who fought back from one set dwon to beat number 9 seed Anastasija Sevastova 6-7 (3-7) 6-4 6-4. Stosur saved two break points to hold serve for 2-2, but Cibulkova broke serve in the sixth game to open up a 4-2 lead before holding serve in the next game. The Slovakian player converted her second set point,when Stosur hit a backhand long. Cibulkova earned four break points in the first game of the second set, but Stosur saved them before holding serve for 1-0. The Australian player converted her second break point for 2-0 after Cibulkova made a backhand error amd held on her service games to win the second set 6-4. Cibulkova saved three break points in the first game of the third set and held her service game with a forehand winner for 1-0. Stosur rallied from 15-40 down to earn a break point and converted it, when Cibulkova netted a forehand unforced error. Stosur held her next service games and earned three match points with a forehand. The Aussie player sealed the win with a service return. The Sydney International is highlighted by Simona Halep and Angelique Kerber, the top two players in the WTA. Both Halep and Kerber won Grand Slam titles during a highly successful 2018 season (Halep at Roland Garros, Kerber at Wimbledon). The tournament also features 2017 US Open champion Sloane Stephens, Petra Kvitova, last week’s Brisbane champion Karolina Pliskova, Kiki Bertens, Daria Kasatkina and Anastasjia Sevastova. Kerber beat Alshleigh Barty 6-4 6-4 in last year’s edition of the Sydney tournament. Last year’s US Open champion Naomi Osaka has withdrawn from Sydney after reaching the semifinal in Brisbane. Halep will make her return after being sidelined by a back injury since the China Open last autumn. Halep, who received a bye in the first round, will take on either Jelena Ostapenko or Ashleigh Barty. The Romanian star hopes that she will be fit for her debut in the 2019 season. “The injury was very scary because it was below the back, so it’s always dangerous, but I had treatment at home. I rested for about six weeks and I did nothing, just exercises for the back. I did not have pain while I was practising during the off-season period. So I now I feel confident and it’s OK. I need to see during the official match. I feel relaxed. I feel rested and I am healthy with the back. As I said, I have not played a match yet, so I don’t know for sure how it’s going to be”, said Halep. An interesting first-round clash will feature Karolina Pliskova and Lesla Tsurenko, who met last weekend in the Brisbane final.